This week I bring you something different! Forest & Shore got in touch and sent me a bottle of their Hallelujah Hair Oil for review purposes. This is available on their website and on amazon.co.uk. Anyone who is into anything organic and natural, this hair product fits right in. 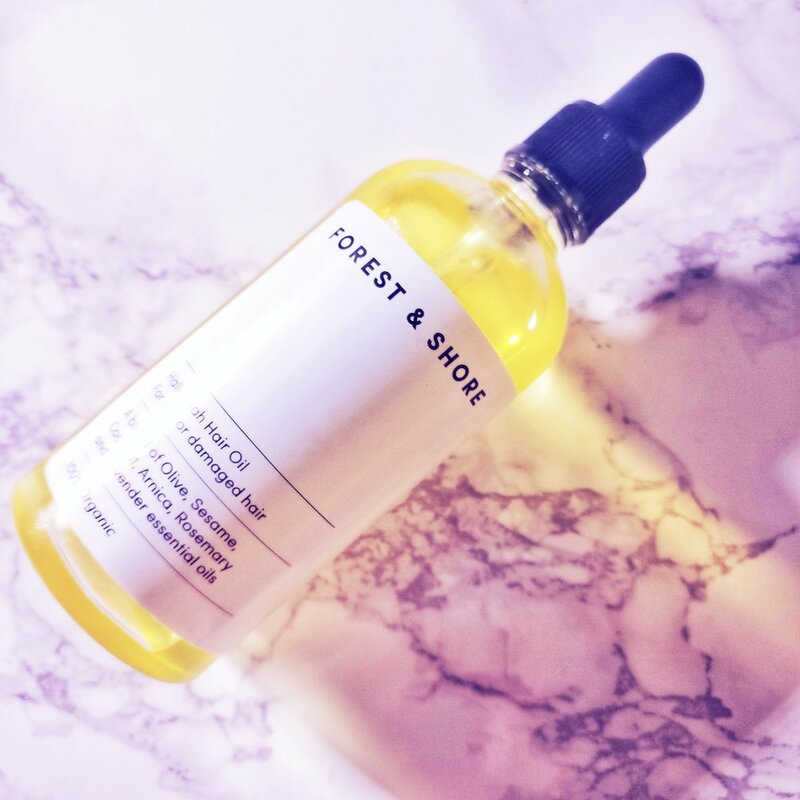 Forest & Shore uses natural ingredients, believes in "plant powdered beauty" - this means that each product is certified organic and 100% natural. They don't test on animals and are vegan friendly, and above all, free from parabens, sulphates and silicones. This hair oil is a blend of coconut, sesame, olive, sunflower & arnica, scented with rosemary and lavender. It's a relatively short ingredients list and none of which are alcohol, silicones, sulphaes and parabens! This product does take time to work, like with many other beauty products, especially when it is to restore and repair. I have tested this for a month and it is now that I do think that this product works for me. To be absolutely honest, I really could not get along with this product at the start. I've used many hair oils before (coconut, argan, mink) and they have left my hair streaky the next day. I already have an oily scalp and hair that needs to be washed everyday because of that; streaki-ness is not something I need additionally. This is what this Hallelujah Hair Oil did to my hair - albeit it is less streaky than some other oils I have used, but nonetheless, it did not put me at ease. Now, I really wanted to like this product because I have not found hair oils that have worked for me, only hair masks. I need something that is easy to apply but protects my hair at the same time. The ingredients list and the packaging got me with this product and I emailed Forest & Shore with my questions and concerns. I have to say that the team at F&S are incredibly helpful and you can tell that they are passionate about the brand and the product. Because of them I persevered with this hair oil and now I come out the other end really loving it. The tip they have given me is actually to use less product than I have done. Because of the length and amount of hair I have, I automatically went for the 5 drops, even though I may not actually need that much. I reduced to 2 and my hair was not streaky the next day. Then I increased it to 3, 4, and I am back on 5 now. My hair is not streaky at all! In fact, it's gotten shiny and smooth after a month of using it almost everyday. It's hard to document this because of how dark my hair is and that it's not originally damaged to a point where any restoration is noticeable. However, as time passes I noticed that my hair is smoother to touch and that says a lot for me because it hasn't necessarily been like that. Sure, my hair is fine, but i still get split ends and damage from heated tools (guilty of curling and straightening irons on the daily! ), so this product has done well in maintaining the quality of hair for me. Surely this is my proper hair oil debut! I love this product and the fact you don't need to use that many drops for your hair means that one bottle will last you a very long time if you're not hair masking everyday. The no parabens/sulphates/silicones really appeal to me as so many hair products contain these and it's not great for your scalp. 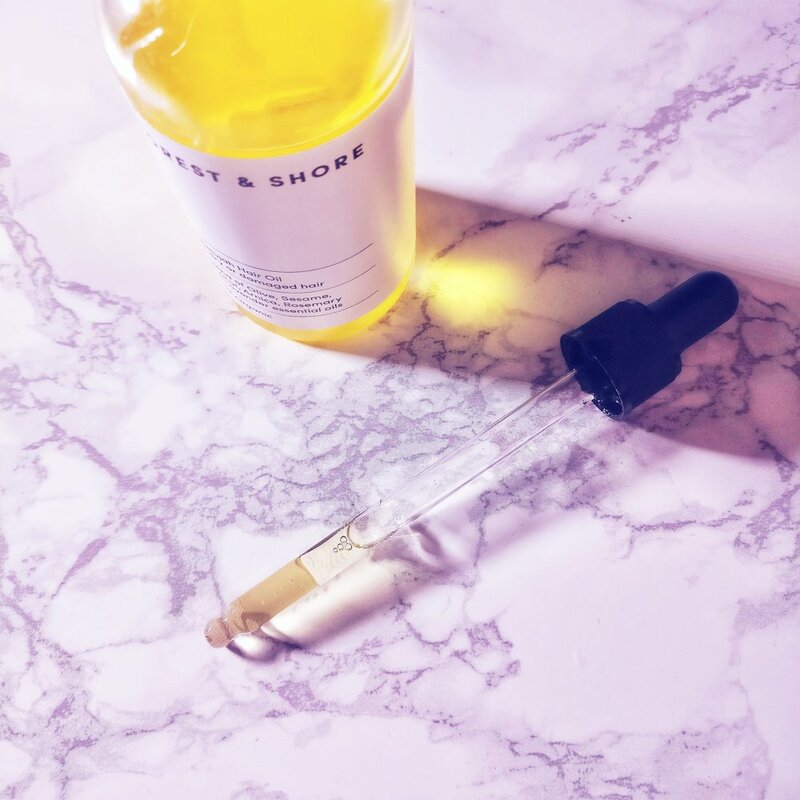 The ingredients and formulation of this Hallelujah hair oil makes it okay for scalp use (as a mask, you may find your scalp getting too oily if you're using it for the daily method). It's highly encouraged to use a wide tooth comb to comb our your hair, and this is written on the box too, but if you're lazy like me, you may skip this - which I have and it's still been okay, but most likely because my hair is genetically straight. This is NOT a substitute for your conditioner (if you use one). Although I don't use conditioner and opted for this, I definitely still benefit from hair masking during my shower to hydrate my hair, then use this hair oil to lock the moisture in (like a moisturiser for the face). I find this has worked for me so instead of having the oil do all the work in repairing, the mask is doing that and the oil acts as a moisturiser and lock everything in. You may need prolonged use to see results. The only qualm I have with this is the pipette - it's not very well designed/made as you can't really get a full pipette of product. This works fine by me as I only use a few drops at a time, but when I do decide to use as a hair mask, it gets slightly harder to measure out how much you need. Finally, a massive thanks to Georgia and Emily at Forest & Shore - I love your formulation and am super pleased that you chose me to work with! This product is my go to after every shower and I am now obsessed with how smooth and soft my hair feels! Thank you for being amazing people even when I was moaning about how this oil made my hair streaky - I'm so pleased I've come to love this product and the brand!